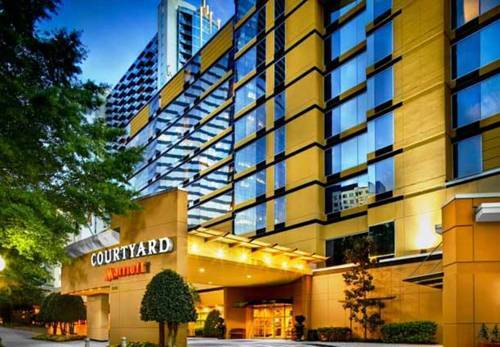 The Courtyard by Marriott Atlanta Buckhead is located in Atlanta's premier business and entertainment district. Conveniently located two blocks away from MARTAs Buckhead rail station and a half mile from shopping at Lenox Square Mall & Phipps Plaza, youll find the best of everything Buckhead has to offer right outside our door. Start your day with a quick, healthy meal, or relax and share a casual bite with friends or colleagues in the Bistro . You will enjoy our new, state of the art lobby, complimentary Wi-Fi throughout the hotel, and easy access to the latest news, weather and airport conditions via our GoBoard technology. Our spacious guest rooms and 1,500 square feet of event space make us the perfect choice for overnight stays, group travel, business meetings, family reunions, and social gatherings.